Originally from Kobe and Osaka, Japan, internationally renowned percussionist Tatsuya Nakatani has toured extensively throughout the world, having performed in approximately 80 cities and 10 countries. Utilizing drumset, gongs, cymbals, singing bowls, metal objects, sticks and bows, he creates collages of sound, which combine the sense of space and beauty found in traditional Japanese folk music with the extended techniques of New Music, yet with great energy and intensity. Although his music defies category or genre, it can be viewed as a cross-cultural mixture of improvised music, experimental music, jazz, free jazz, and rock. In addition to live solo and ensemble performances, he has provided sound design for films and television projects. The latest of these was the performance of an improvised sound score for silent movie- “The Water Magician” (1933, directed by Kenji Mizoguchi), which was part of exhibition of Hiroshi Sugimoto Photograph at the Smithsonian Institution in Washington, DC. He is the recent recipient of The Bronx Arts Council Individual Artist grant. Also he has been seIected PennPAT Artist Roster 2007(Pennsylvania Performing Art on Tour). 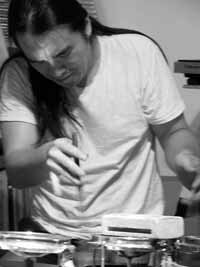 In addition to his work as a percussionist, Nakatani heads H&H Production, an independent record label and recording studio based in Easton, Pennsylvania.